Eric Schmidt, executive chairman of Google holding company Alphabet, will head a new Department of Defense advisory board aimed at forging closer links between the U.S. military and Silicon Valley. The Defense Information Advisory Board will serve to identify quick and innovative solutions to DOD problems. It will do this by advising DOD leaders on "innovative and adaptive means to address future organizational and cultural challenges," the Pentagon said in a statement. It will not be involved in military operations or strategy. It's modeled after a similar board that advises the DOD on business and has sought to bring best practices from the commercial sector into the Pentagon. The board will have up to 12 members, who will be hand-picked by Schmidt and U.S. Secretary of Defense Ash Carter. The members will be people "who have successfully led large private and public organizations, and excelled at identifying and adopting new technology concepts," the DOD said in a statement. Ash Carter has sought to forge closer links with Silicon Valley since he became Secretary of Defense just over a year ago. Carter sees the need for the DOD to not get left behind in an increasingly cyber world, and wants to learn from and emulate the innovation culture that pervades and defines many start-ups. Earlier on Wednesday, Carter announced plans for the DOD's first bug bounty program. "Hack the Pentagon" is modeled after similar cybersecurity initiatives in the private sector and will seek to identify vulnerabilities in the department's public websites. 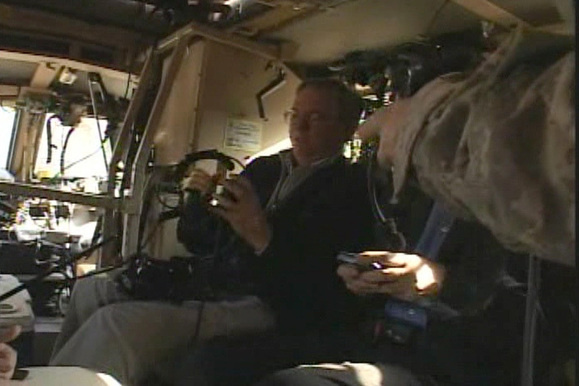 Eric Schmidt, then CEO of Google, in a military vehicle during a visit to Iraq on Nov. 23, 2009.